My last few weeks of 2010 have been spent in Tampa with my family, who I haven’t seen since summertime. It’s a bit ironic that I ended up bringing freezing evenings and windy days with me from Tallahassee. If my parents knew that the cold weather would be their Christmas present, they probably would’ve told me to stay at FSU for the remainder of December. I have a bit of a history of not finding the ideal gifts during the holiday season for friends and family. It’s not that I’m a last-minute shopper or anything, but I end up picking out the strangest things when surrounded by so many colorful sale signs and new gadgets that come out just in time for the holidays. I’m one of those suckers who go into Brookstone and think that every pointless invention is the best gift ever until it gets put back into its box after Christmas Day and collects dust for the rest of eternity. Discarded with those gifts are my memories of the year 2010. Even though my memories of this past year are in the rearview mirror, the lessons that I have learned will stick with me for years to come. on an old school phone. 2010 was a year that ALPHA started to branch out and do new things. Notably, this year ALPHA impacted the airwaves of paranormal internet radio, an idea that Ron and Scott have been planning out for quite some time. Our transition into talk radio humbly started as an ending segment on Lake Erie Paranormal’s “L.E.P. Radio” titled “Dead Ends.” Once we familiarized ourselves on how things were operated and got more comfortable doing talk radio, we launched our own paranormal radio show called “Dead Serious Radio.” DSR was envisioned to be a show that listeners could get excited about because of the way we address topics that other shows tend to shy away from, while still maintaining a humorous charm that keep fans wanting more. Part of this want for more DSR comes from my knack to miraculously track down musical talent from all around the country for my “Bill Me” segment at the end of the show, as well as the banter between our witty co-hosts. I’ll admit it; we can be jokesters at heart. However, when things get serious, ALPHA gets “Dead Serious.” See what I did there? 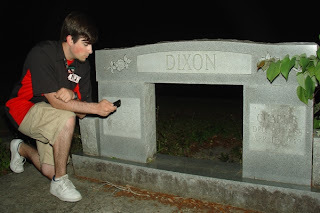 I was able to plug ALPHA and Dead Serious Radio in the same sentence. 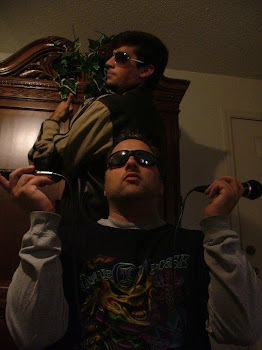 I’ve gained the reputation as the shameless plug man on the show, especially in Scott’s absence since I fill in for him as co-host while he is away filming for GHI. Wow, I’m on fire! Was that a Ghost Hunters International plug, too? You bet it was! ALPHA’s emergence into the media realm has not stopped at internet radio in 2010. Both Ron and I have been featured on the local FOX station in Tallahassee for an entire episode of the weekly “Live in Tallahassee” television show. We did a short investigation of the historic Mission San Luis, bringing along the LIT crew to enjoy the ride and pick our brains. Everything we filmed that night was a one-take shot, so Ron and I were on our A-game and doing what we do best while looking pretty for the camera. What can I say? Some people just photograph well, and ALPHA doesn’t fall short in that category. Watching myself on television certainly was a surreal feeling after it was all said and done. It’s true that I have the experience of being in a documentary from when we filmed Dead Air back in 2009, but it was humbling to see Ron and me on FOX with a few cuts to commercials thrown into our investigation. Just when I thought we got our 15 minutes of fame, something even bigger came our way. 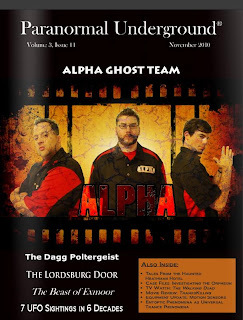 During the fall, ALPHA was contacted by the writers at Paranormal Underground Magazine. They inquired about having our group be the featured story, and on the front page. When an offer like that comes around, you can’t say no. 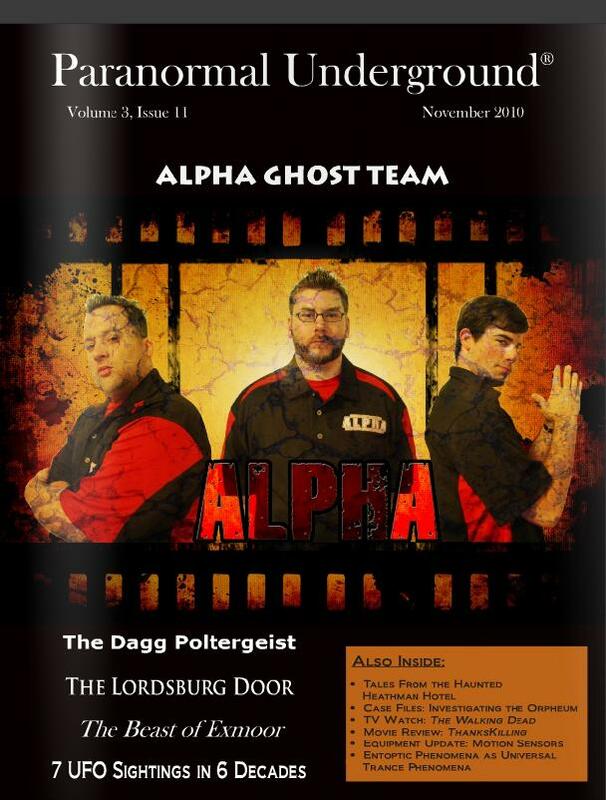 As it turned out, no paranormal investigation group has been featured on the front cover of Paranormal Underground. To be the first group on the cover of the magazine was such a great honor. The only thing left to do was actually take pictures for the spread. We went to a location that I swore to keep secret, and went to work as newly established paranormal models… or “Paramodels.” The long hours that went into the photo shoot produced quality pictures for the cover and the featured article. I was impressed with the end result of our project, and the magazine as a whole. The November 2010 issue of Paranormal Underground looked great, and had even better articles. I can say that I am proud to be featured in some quality bathroom and waiting room reading material for the paranormal people out there. Even though it seems like ALPHA spent a lot of time handling the media, you can rest assured that we stayed true to our roots and managed to conduct numerous investigations throughout 2010. It’s hard to believe that we would be able to get the whole group together, especially when Scott is gone every few weeks filming GHI episodes overseas. We overcame the odds, and did what we did best as a whole team. During the spring, ALPHA went on an investigation spree of a number of locations in Monticello, FL. Our detailed reports of these investigations can be found on the ALPHA Ghost Team website. Hard at work in Monticello, FL. So here’s to 2010: the year that ALPHA did anything and everything. I can’t remember a week that I didn’t have any work to do for ALPHA. From this adventure, I have become more experienced in different forms of media while helping bring ALPHA to the forefront of the Paranormal Field. It has been a fun ride, but we never forget our focus that we’re about bringing integrity and professionalism to paranormal investigating. With that being said, it seems like a lot of people out there are starting to notice the work that we are doing and are supporting it. What is next for ALPHA in 2011? I don’t want to spill the beans, so I’ll let you wait and find out. from the ALPHA Ghost Team. What a great post! I think you're becoming a stronger writer too. Blogging can certainly influence such an improvement (though I still believe that keeping a journal does not. Too sloppy, even with best efforts). Oh, btw, you did very well with presents this year. World, he got me the original Superman cartoon (I'm a Batman girl, but I can appreciate this) and - here he scores big - some episodes of Jimmy Neutron and Classic Fables: Puss in Boots. Yay, really old fairy tale cartoons! I had no idea you were the first ghost hunters to appear on the cover of that mag! How cool! And after recapping the year, it's great to see how much you all really accomplished. I'm sure you'll do great in the coming year.